Uraninite is a highly radioactive and interesting mineral. It is the chief ore of uranium and radium, which is found in trace amounts. Helium was first discovered on the earth in samples of uraninite. Radium and helium are found in uraninite because they are the principle products of uranium's decay process. 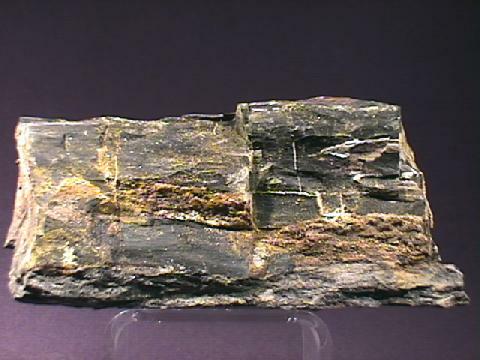 Weathered or otherwise altered uraninite produces some wonderful by-products such as the beautiful uranyl phosphate minerals like autunite and torbernite as well as uranyl silicates like sklodoskite and cuprosklodowskite. The structure is analogous to the structure of fluorite, CaF2. The structure of fluorite is highly symmetrical and forms isometric crystals such as cubes and octahedrons. Flourite also has four directions of perfect cleavage that produces octahedrons. However, in uraninite, crystals are rare and the cleavage is not usually observable. A variety of uraninite is called pitchblende which is a combination of mostly uraninite and some other minerals. It is generally softer and less dense and usually botyroidal or earthy. Remember, this is a highly radioactive mineral and should be stored away from other minerals that are affected by radioactivity and human exposure should definitely be limited. Color is black to steel black with tints of brown. Luster is submetallic to pitchy and dull. Crystal Habit is typically massive botryoidal, earthy, lamellar and reniform aggregates. Well-formed individual cubic and octahedral crystals are rare. Cleavage is poor in four directions (octahedral), and is rarely seen. Associated Minerals include cassiterite, pyrite, native silver, autunite, uranophane, uranocircite, torbernite, meta-torbernite and other uranium minerals. Notable Occurences include Bergen, Germany; Autun, France; Cornwall, England; Mitchell Co., North Carolina and Mt. Spokane, Washington, USA; Zaire; wilberforce and Great Bear Lake, Canada; Portugal and France. Best Field Indicators are luster, color, radioactivity and streak.